My name is Ian Wylie and I am a former Fleet Street reporter, writer, editor and TV specialist now working as a freelance journalist based in Northumberland. Having written for a range of UK national newspapers, I now work with ITV on the interviews for many of their drama press packs / production notes. 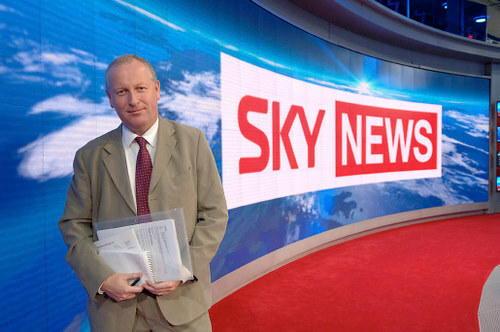 Until October 2009 I was the London Editor & TV Editor of the Manchester Evening News / MEN Media, based for the last 12 years in my west London home office after decades in both Fleet Street and Farringdon Road. I’ve written about television for many years, concentrating almost exclusively on it since 1997, interviewing thousands of people along the way, including a poignant last interview with Jill Dando exactly a week before she was murdered. I regularly interview actors on the sets of Britain’s top TV dramas across the UK and Europe, as well as interviews in London and elsewhere after their work is done. Plus writers, directors, producers and TV executives via – to name a few – Cold Feet, The Durrells, Maigret, Marcella, Endeavour, Downton Abbey and the cobbles of Coronation Street. And as a Fleet Street news and features reporter I’ve covered many of the top stories of the last 35 years. Scroll down the page for the full story. Current and recent projects include ITV cast and production interviews for Wild Bill with Rob Lowe, Hillsborough drama Anne, The Durrells 4, Cleaning Up, Grantchester 4, Torvill & Dean, Cold Feet 2019, The Widow, Cheat, A Confession, Deep Water, the outstanding 2018 seven-part adaptation of Vanity Fair, Dark Heart, Endeavour 2018, Butterfly, Maigret in Montmartre, Hatton Garden, Bancroft, Next of Kin and Innocent. Hosted by Jonathan Ross, the evening was attended by most of the Downton cast, past and present, including Dame Maggie Smith and Dan Stevens. 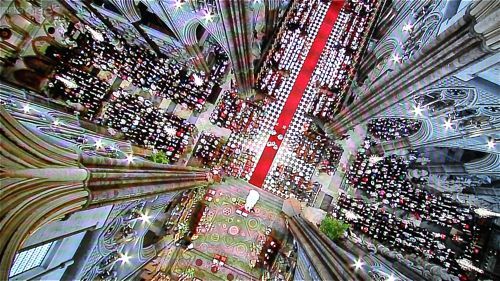 It was also recorded for broadcast on ITV at Christmas 2015. Vanity Fair – an ITV / Amazon / Mammoth Screen production. Vanity Fair features Michael Palin as author William Thackeray. Other relatively recent work for ITV includes Vera series 7 (2017), Little Boy Blue, Grantchester 2017, Fearless, The Loch, Harlots, Safe House 2, Cold Feet 2016 and Cold Feet 2017, Brief Encounters, Paranoid, Unforgotten 2, The Level, Tutankhamun, HIM, The Halcyon, In Plain Sight, interviews on location in Budapest for Maigret, starring Rowan Atkinson, in Corfu for Keeley Hawes and co filming The Durrells, Jericho, Marcella, Julian Fellowes’ adaptation of Doctor Thorne, Beowulf, Churchill’s Secret, Home Fires series 2,, Houdini and Doyle, Prey 2, Unforgotten, Peter and Wendy and Jekyll and Hyde. Plus The Trials of Jimmy Rose, Midwinter Of The Spirit, Black Work, Code Of A Killer, Safe House, Home Fires, Cilla; Grantchester; ITV Encore (Interviews with ITV Director of Television Peter Fincham and Broadchurch Producer Richard Stokes); Chasing Shadows; The Great Fire, the concluding 2015 series of Foyle’s War, which included a guest role by Frasier star John Mahoney, Mrs Biggs, Prey 1, The Bletchley Circle Series 1 and Series 2, Mr Selfridge Series 1 and Series 2, Lucan and Scott and Bailey. 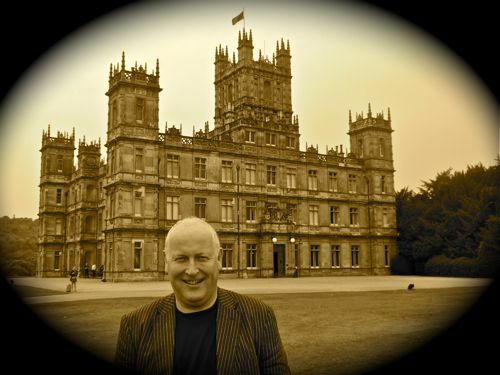 Trainee footman Wylie visits Downton Abbey for the second series. 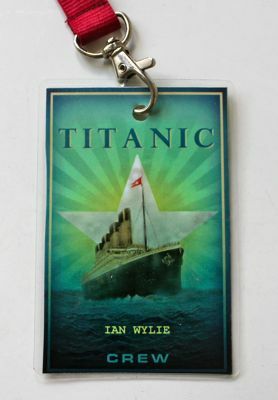 I spent a week on set at Stern Studios in Budapest (June/July 2011) with the cast of Titanic – ITV1’s major drama series screened worldwide in March and April 2012. Commissioned by ITV to write the global press pack, I was given the most access to filming, the incredible set, cast and production team compared to any other journalist. I completed 25 one-to-one interviews, including 17 principal cast members, writer Julian Fellowes and several key members of the production. Click here to read my 25 interviews in the ITV Production Notes. I also played the role of Man Trying To Hide Behind Church Pillar at the wedding of Tom Barnaby’s daughter Cully in Midsomer Murders. And did much the same as one of just 28 reporters from all over the world invited into Westminster Abbey for the wedding of Prince William and Kate Middleton. They even sent me a slice of their wedding cake. 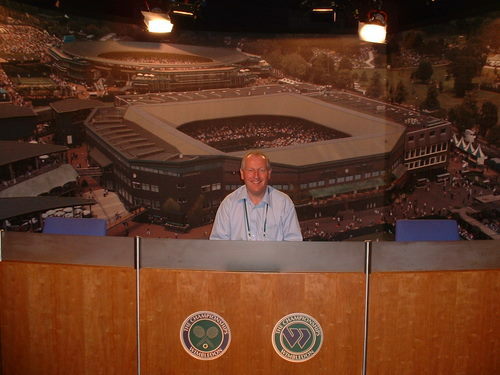 The Life of Wylie blog started in the summer of 2006, when I took a fortnight out to report on the tennis at Wimbledon – an event I covered for several years as an associate member of the Lawn Tennis Writers’ Association. I wrote this for Press Gazette about my working week at SW19. This blog has (Jan 2018) recorded 1.4 million page views since it was moved to the WordPress platform four years ago and has many loyal readers who spread my work across the web. During my journalism career to date, I have been lucky enough to be present in the front row at many moments of history. That includes being the lead reporter sat just a few metres away from Charles and Diana during their wedding at St Paul’s Catherdral and a similar role for Diana’s funeral at Westminster Abbey. 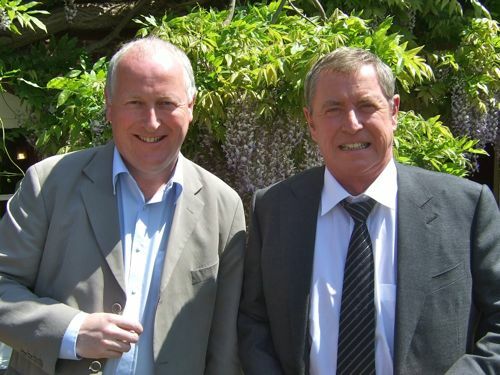 As a member of the Parliamentary Press Lobby for 25 years, I covered several general election campaigns – I was standing opposite the door of No 10 when Tony Blair walked in for the first time as Prime Minister – and helped lead MEN Media coverage at Westminster of the MPs’ expenses scandal. And, sadly, arrived very early at the hospital when, then, Labour leader John Smith died. 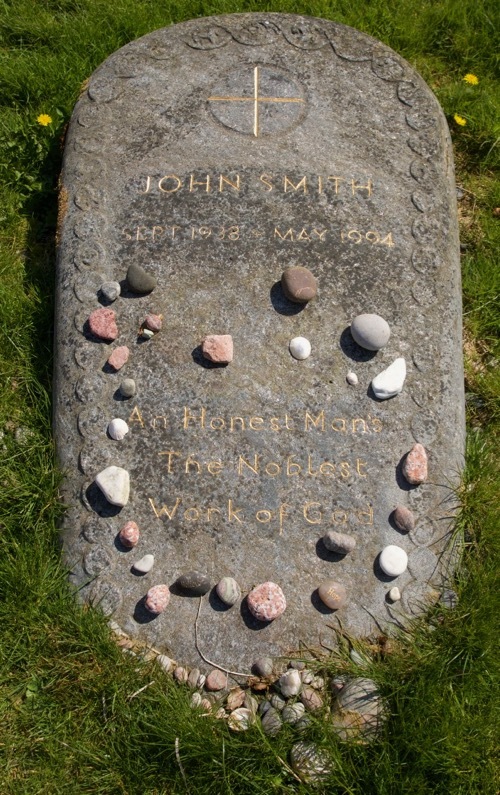 In 2018 I was finally able to pay my respects at John Smith’s grave on the Scottish island of Iona. Not forgetting decades of covering all things Myra Hindley, London bombings from IRA to 7/7, many Old Bailey trials, starting with the Yorkshire Ripper, hundreds of High Court cases, the Queen Mother’s funeral, George Best’s life and times (the morning after that Wogan interview was just one of many memorable moments), Eric Cantona’s seagulls and trawler (both the copy-taker and newsdesk thought I’d gone mad), the World Darts Final and countless other highlights not involving giant trays of lager. An ankle injury meant I had to quit Top of the Pops dance troupe Legs & Co.
Now I am a freelance, still as fascinated by what I do as the day I started. You can read a recent (August 2016) interview with me here. In my spare time I like to take photographs. A number of my pics have been used in UK national newspapers, as well as international magazines and books. If you’re still awake, thanks for reading this far. Can’t wait to read more blogs! I’m sorry to hear about the job changes and I wish you all the best in your new ventures. I first read “Life of Wylie” when I discovered Spooks and really enjoyed your interviews from the Grid. I’ve since read many of your other posts. Good luck and I will look forward to visiting your new sites and reading your work. I had no idea you’d been the victim of cost cutting at the MEN. Sorry to hear of your plight. Glad to see you’re alive and kicking. We can’t live without your excellent Ashes To Ashes coverage and the interviews and insights into television in general. Keep up the excellent work. I shall bookmark you forthwith. I really enjoyed reading your blogpost, keep up writing such exciting stuff. Ah That explains the short break…. Glad you seem to have settled into your new corner of the web. Im sure that there is no need to wish you all the best but i shall anyway. Heres to a fantastic 2010 for you Ian. I work for Patrick McEnroe and have set him up on Twitter and Facebook and thought you’d be interested in possibly following/fanning him! Not sure if this is the best way to contact you, but if you have any questions please feel free to connect with me. You might like to check out my blog spot (if you can find it)! GENE HUNT IS BEING KEPT ALIVE ! Have already written the ending and it’s all under lock and key. Surely a movie is called for? No idea if Matthew and Ashley even have thought of any more but I certainly have if nobody else does it….! Have been a fan of yours for quite awhile. Love reading your blog and tweets. We seem to have a mutual affection for quite a few of the same entertainments in life: various tv shows, actors: Dawn & Julie, Robson & Ronnie. I only wish we could receive a live feed from the BBC and ITV directly to our home in NY. Just wanted to let you know that you have fans all over and we love your ‘voice’ in the world. Now my ulterior motive: you must start a campaign to have Matthew Macfayden and Keeley Hawes cast in a remake of “The Flame Trees Of Thika.” For family viewing time, we re-watched over the last couple of weeks and thought, how absolutely stunning it could be. Gorgeous locations (they could even have the same production team behind “Ladies #1 Detective..”), lush costumes (who doesn’t look good in safari gear? okay maybe not Jeremy Clarkson) and of course, the cast: Matthew & Keeley (who are the perfect age) and some sweet fresh young girl to take on the role of Elspeth. Sounding good isn’t it? Have your people work on this. Alrightie then. My job is done here. I just ask that I get invited to the premiere. Ha! Hi Ian, I accidently ended up on your blog, how is another story, but i felt i had to say hi. The reason being, i also am called Ian Wylie, lol i couldn’t believe it when i looked here. Sounds like you have had a wonderful life from what i see here. Keep it up.. and Happy Xmas..
And a very Happy Christmas to you, Ian! Are you the Ian Wylie who made the stunning photoseries of a cuckoo chick many years ago??? Not me, Morten. But sounds interesting!